Hazel Newlevant is an interesting young cartoonist whose aesthetic eschews the vast majority of prevailing trends. Whereas many cartoonists tend to use a clear line for "cute" character design, drawn on a computer, Newlevant's comics look hand drawn and painted, with a naturalistic bent. There's a certain sense of passion and unrest bubbling under the restraint many of her characters evince. I'll be reviewing her work over the next three days. The first issue of her series No Ivy League is an autobio strip featuring teenage Newlevant working her first summer job pulling ivy at local parks. While it's autobio, Newlevant is careful to establish themes and smooth out the narrative in such a way to make it clear for the reader. For example, the first page establishes her making out with her boyfriend and being interrupted by his mother, setting up a tension between Hazel and his mom. The second page sees Hazel painting while we meet her parents, who are clearly supportive. Then we quickly learn that she was homeschooled and felt nervous about fitting in with more mainstream high school kids, who are pointedly a highly diverse mix of races, ethnicities and economic backgrounds. 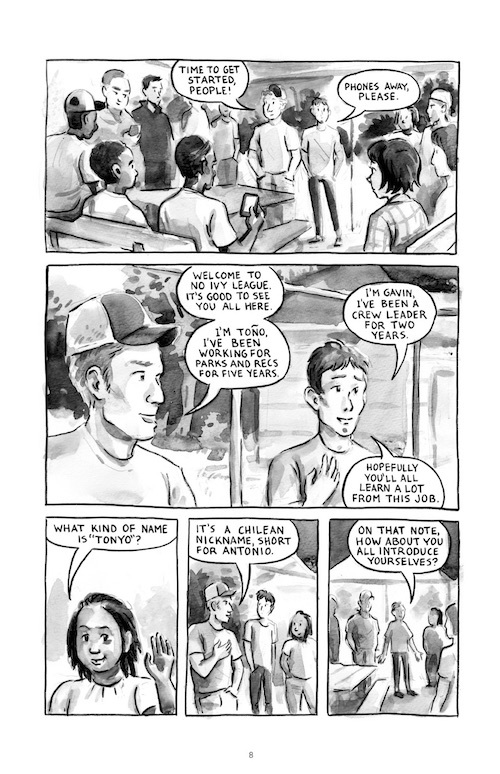 The rest of the issue is Hazel at her first day of work, interacting with different kids with different results. She bonds with a girl with gauges in her ears but fails to bond with an African-American guy who derides her for trying to look "down" when she asks him about his favorite rappers. While the issue is mostly set-up and background, Newlevant still manages to create emotional stakes right from the start without showing her hand too much. Her character design is pleasingly spare, as it combines a mostly naturalistic approach with faces that are particularly expressive. I'll be curious to see where the series goes from here. 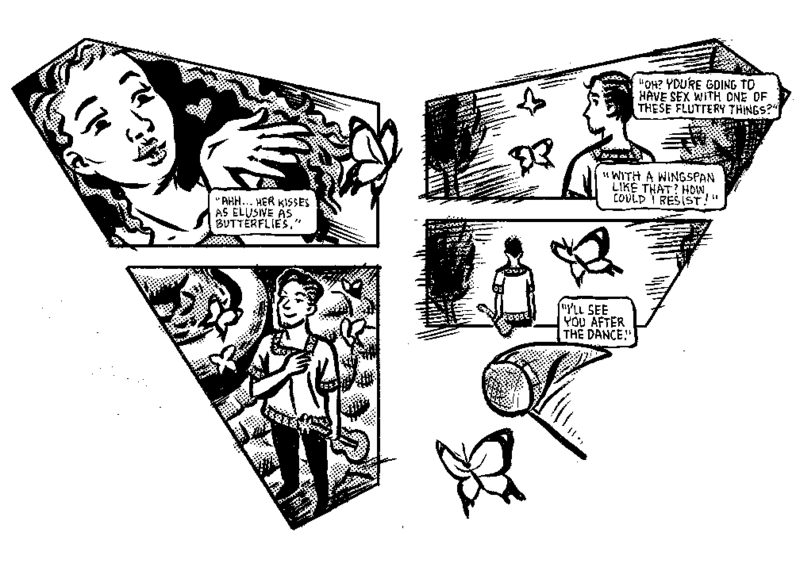 Mariposa is a mini that she did with Jesse Reklaw, during a period where they were regular collaborators. I honestly can't quite tell who did what in this comic, which is a fascinating mash-up of polysexual expression and scientific exploration. Somewhere in Latin America, a lepidopterist is searching for a rare breed of butterfly. Meanwhile, a neighbor from across the hall is having all sorts of sexual adventures with men and women alike. She even flirts with the scientist, who has a one-track mind about what he's doing (as does she!). However, a bit of local intelligence that she provides for him leads to astonishing discoveries about the butterfly's gender and sexual identity, until seeing her with two sexual partners of different genders leads him to a remarkable discovery. 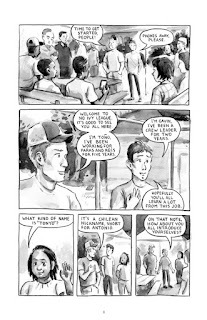 This is a smart comic that doesn't view any of its characters as being more worthwhile than any others, even as it gently mocks myopic behavior. The thick lines give the comic a feeling of a weight that's almost comforting, like a blanket. 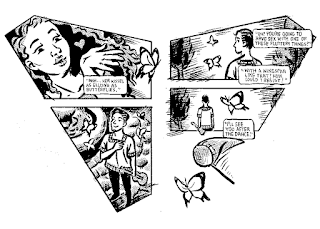 The pages, when opened up, are shaped like a butterfly, which provides some opportunities for some interesting formal tricks, but are almost beside the point with the characters, drawing and the story itself being so compelling on their own.